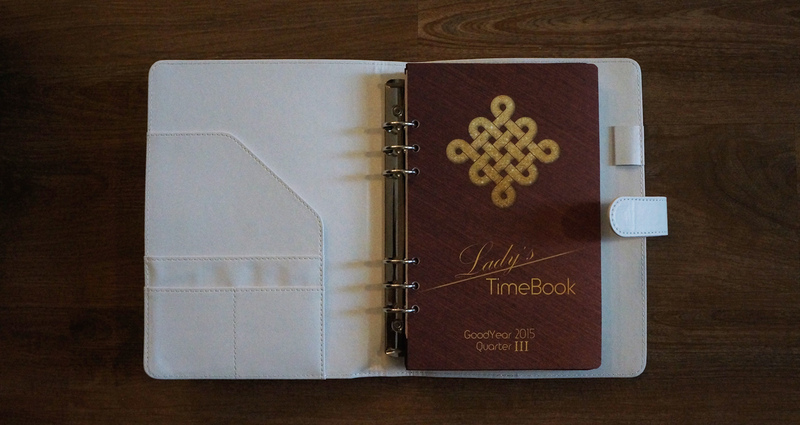 The TimeBook is a unique calendar notebook specifically designed to aide your personal development. 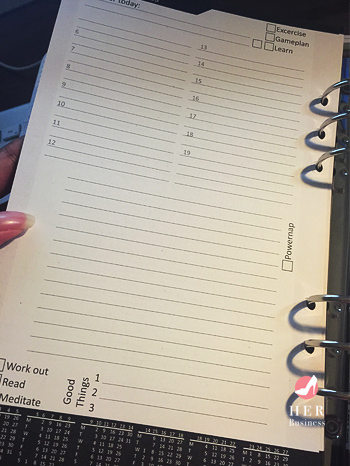 It’s packed with daily goal, priority management, and self-analysis sheets that allow you to track your progress. Being able to look back at your progress and the daily milestones you have achieved will only motivate you to achieve greater goals the following day. I’ve just received this product in the mail and wanted to share with you all my honest review of this product as well as how to use it. I received the leather-bound version of the book which in my opinion is a great size. It is incredibly well made with pockets on the side where you can add little notes, and a nice slot for your pen or pencil. Flipping through the book, I became excited at all of the content actually included in this product. 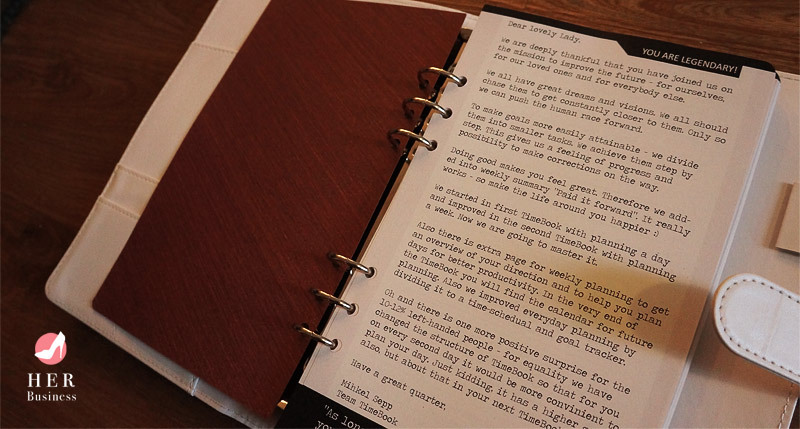 At first glance I could tell that this product serves not only as a journal and goal tracker, but also an awesome resource for motivational and informational context. I must admit, I became a bit overwhelmed with the many different sections of the book and became confused on how exactly to use it based on the many different sections alone. This however was through simply flipping through the pages initially. To be honest, I did encounter a few grammatical errors through out the book. However, it is nothing so detrimental that it detracts from the books functionality. Once you are able to get past the errors & flip through the pages, you will uncover more & more uses for this book. As we all know, writing down your goals assist you in actually achieving them far more than simply keeping these ideas in your mind. Each TimeBook that you get is labeled and organized for each quarter of the year. The first page gives you a simple list of a few goals you can write down that you hope you achieve for the next 3 months. The subsequent pages further breakdown your timelines into weeks and days. This is where you can write down what milestones you’d like to hit each month. Don’t let this discourage you. You don’t have to figure out everything you’d like to accomplish per day, per week, WEEKS in advance. That would drive you crazy! Instead, use it as a roadmap to give you an idea of where you’d like to be 3 months from now. Write general goals first, maybe one main goal per month. As time goes on, you can always go back to those pages and fill in the details of how you will achieve those main goals in steps. The key is to simply write SOMETHING down. About 80% of the book is filled with these pages. This is where you will get the best use out of this book. I can only assume that the page context is assembled in such a way that the top of the page symbolizes the start of your day and the bottom of the page being the end of it. These are three GREAT ways to start your day. Even if you don’t typically have an idea of anything specific you’d like to tackle that day, so long as you do those 3, you can still considerate it a great productive day. Don’t have time to work out in the morning? Try getting in that exercise at night, read something useful, or meditate. I also love how there’s a “Power Nap” check box right in the middle of the page that is suggestive of getting one in midday! Another neat addition is in the pages designated for journaling. These pages are found at the end of each week and can serve as a great way to get your thoughts on paper about how your week went, what you’ve learned, & how you feel. Along side these pages, you will also be pleased to find inspirational quotes and informal pictures & diagrams as you flip through. You will literally find yourself learning something new each step of the way. I must say, this book does a great job of giving you tons of informational content grow with – it keeps you engaged! It’s definitely a great “down time” tool for when you’re in the mood to learn something new or to be inspired but aren’t sure where to look. Other little gems you will find through out this book are video recommendations that you can scan and watch instantly with their QR codes. There are literally dozens and dozens of these. Some pages even have give you a few lines to write down your reflection on what you’ve learned from what you’ve watched. This is actually quite important because the moment you written down something you’ve just learned, the longer it sticks and lingers within your mind. On top of video recommendations, this product is also packed with vibrant motivational photos that inspire you with every page flip. This is a pretty good product for anyone who finds that they focus better once they’ve organized their thoughts. If you’re just getting into the idea of creating your own reality, the massive amounts of content in this book may seem a bit overwhelming at first. However, don’t fret. The best way to use this book really is however you please. Just because there are pages for goals, to-do lists, journaling, reflections… doesn’t mean you have to fill everything out. Write down what you feel most comfortable writing. Do what makes you happy, write what makes you smile. Check off tasks that you find to be the best use of your time. Use this book as a guide toward shaping better productive days that mentally stimulate you. Simply put, having the ability to look back at your progress and the daily milestones you’ve achieved only motivates you to achieve greater goals the following day, week, month, year. The more you’ve done the more you will want to do. It’s also a GREAT way to document your manifestations. Your faith to attract what you want grows with your proof of attracting what you’ve wanted. you may want to pre-order before the quarter starts. 28 Year old Webpreneur with 10 years experience in Web/Graphic Design, UI/UX Design, Web Development, Photography, Illustration. 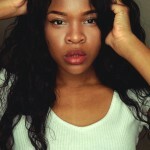 Founder and Editor in Chief of Minding Her Business.